Buckley's of Dunolly, a former goldfields hotel, has two upstairs luxuriously appointed double bedrooms with queen size beds, one with private ensuite. The upstairs breakfast room has coffee, tea, cereal, microwave and bar fridge. 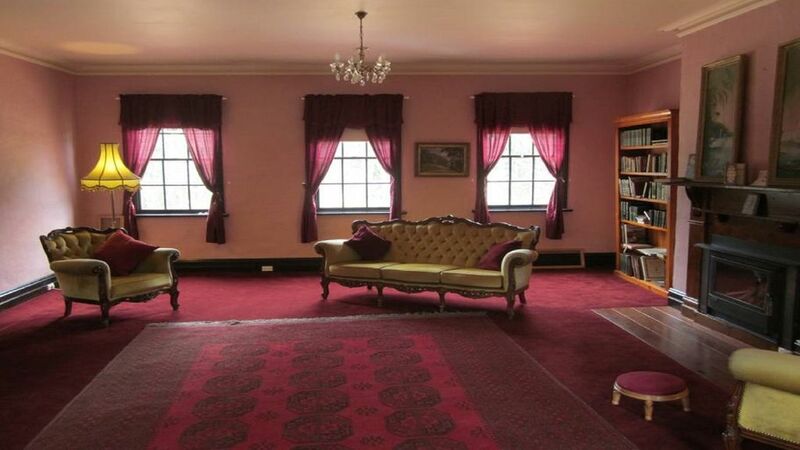 The former ballroom is for exclusive use by guests, with television, comfortable sofas, board games and books. We are situated on fifteen acres of garden and bush land. The rooms have electric heaters and a wood fire place is in the guest lounge. Breakfast room upstairs with toaster and kettle and utensils are available. Milk, cereal, juice, fruit, yoghurt , jam and bread for toast will be supplied. The television is in the guest lounge. The bedrooms are upstairs. The stairs are steep. Regrettably this is restrictive access for those with mobility difficulties. This area is popular for gold detecting with many successful finds reported. It is also a popular walking and bicycle area. We had a wonderful stay! All the rooms had beautiful and charming interiors and everything that we required was provided. Most of our time we spent sightseeing and hiking in the surrounding areas. Thank you Rachel for your history insights and hospitality. Where to begin? A dreamy weekend in a dreamy house with a wonderful host. Rachel goes out of her way to make her guests feel welcome and comfortable. It's a beautiful house and so quaint, cozy and personal. So if you wanna unwind by the fireplace after a memorable day running around the plains chasing after 4 beautiful dogs, your search stops here. And don't forget visiting the gold mine near the place. It might be your lucky day! thanks, Max. It was such a delight to meet you both. I'm so glad you liked the walks around the area. We actually had an echidna walk around the property after you left, and all the wallabies came back (they must have been hiding away for the weekend ! ) I'm so glad you were comfortable and that you enjoyed the old property as much as I do. All the very best to you both.